Remember, always closed on Wednesdays and Sundays! Closed Friday morning (Good Friday) April 19, 2019. Will be open by 1 pm that day. Westmoore Pottery is a small company interested in preserving a piece of our past. This is reflected in the wares I sell -- historical pottery, a little handblown glassware, as well as books on historical decorative arts and cookery. The entire staff of Westmoore Pottery is one person, Mary Farrell (me!) Other than the month of January, I unload a kiln load of new pottery every two weeks. The pottery is made on the premises here in the Westmoore Community, halfway between the tiny towns of Seagrove and Robbins in North Carolina. The ware is made in the old traditions with the look and feel of pottery from the 17th, 18th, and early 19th centuries, up to around 1850. 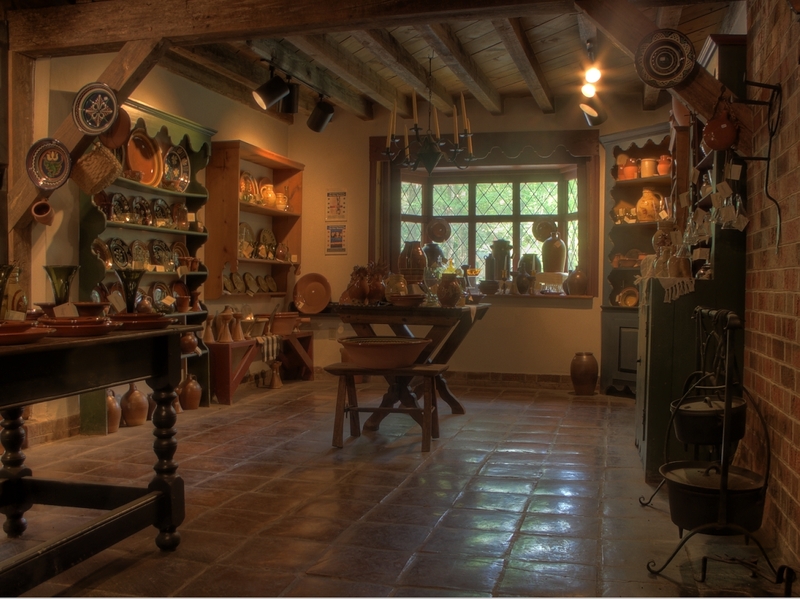 A special interest of mine is pottery which was used in the early days of North Carolina; this includes pottery made in England, Germany, New England, Virginia, Pennsylvania, and of course, pottery made in the central area of North Carolina. I make several types of pottery here at Westmoore Pottery: redware, both plain and decorated; salt-glazed stonewares; and green-glazed wares. The pottery is made to be used and the glazes are absolutely lead-free. Westmoore's pottery has been used by over 120 museums as furnishings for historic buildings and in programs. I have also supplied pottery and glass for a number of historically-based films. Westmoore's pottery can be found in several museum collections and is enjoyed by many private individuals as well. For more detail about all the work I sell, visit the "Wares for Sale" section of this website. I like being a small business and intend to stay small. Potter Mary Farrell does everything -- making the pots, waiting on customers in the retail store, and mopping the floors! It gives me great joy to be able to present to the American public a product that still has the heart, soul, and pride of the maker behind it. Browse this website, and if you have unanswered questions, don't hesitate to email or call. Hours when open may vary.